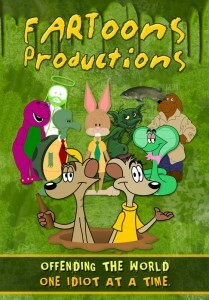 FARToons Productions launched in 2001 and since then has polluted the internet with cartoons, videos, comics, audio skits, merchandise, and more. The web site showcases the unique, crude and often offensive humor of award-winning animator Ryan Wells. FARToons and all its original content is Copyright © 2001-2018 Ryan Wells. Credit is not taken for any unauthorized Copyrighted materials in regards to audio or visuals used within original cartoons, videos, artwork, etc. All unoriginal material is Copyright © their respected owners.